If 2018 is your time to finally take the family to Walt Disney World, look into booking one of the value Disney Springs Hotels which offer specials for stays almost all year long. Bargain watchers take note: these hotels (in the commercial area formerly known as Downtown Disney) are closest to the parks without being Disney managed, offer free shuttles every 30 minutes so you can leave your car parked, and offer several perks like early admission and military family discounts. 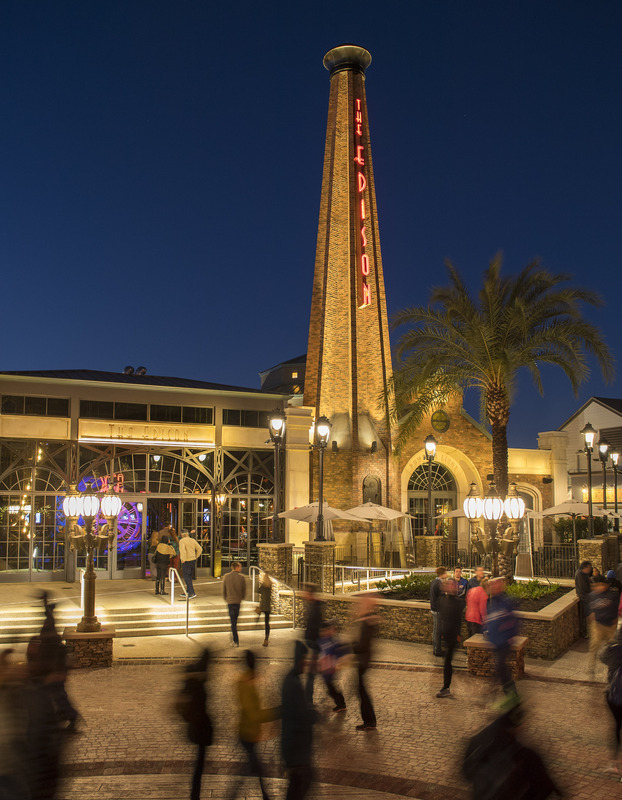 The Edison is one of many restaurants and clubs with free live music that make Disney Springs such a magnet at night. In and around days packed with themepark fun, it’s easy to check out the 130 establishments operating in this big lifestyle mall. You can do a little shopping, get high in a hot air balloon or enjoy a night out. If you’re traveling with kids, there’s so much window shopping and streetview entertainment — at outdoor cafes and from buskers out in the street — that you can even skip the theme park admission for the day and save that way, too. Walt Disney World Resort, comprising four huge theme parks plus two great waterparks, has some amazing festivals going on nearly all year long to complement the rides and shows. At Epcot, perhaps the most edutaining of the parks, they include the Epcot International Festival of the Arts — great with older kids and grandparents; the gorgeous Epcot International Flower & Garden Festival where we saw “pizza” growing in the kids garden (tomatoes, basil, mushrooms and wheat); the foodie favorite Epcot International Food & Wine Festival; and the delightful Epcot International Festival of the Holidays, where a variety of cultures show off their holiday spirit and decor. Other must-see attractions include “Happily Ever After” — the most spectacular fireworks show in the history of Magic Kingdom Park; “Pandora – The World of Avatar” at Animal Kingdom; and the new “Toy Story Land” where all ages adore the larger-than life, tall grass setting of Andy’s backyard. It’s part of a big reimagining taking place through 2019 at Disney’s Hollywood Studios. Of course, some of the most popular rides require planning ahead, too, so you’ll have to apply for Fast Passes as soon as you get hotel reservations. Our favorites are “Star Wars: A Galactic Spectacular Fireworks” at Disney’s Hollywood Studios; “Frozen Ever After” and “Soarin’ Around The World” at Epcot; “Kilimanjaro Safaris” and the nighttime spectacular “Rivers of Light” at Animal Kingdom. The Disney Springs Hotels have summer and fall packages in which guests can access a 60-day FastPass+ and be sure to get the ride times they prefer. And if you need more reasons to go to Disney now, our What’s New at Disneyworld roundup explains the latest openings. At all Disney Spring hotels, there’s plenty of space to be family — or the hot young couple you were #bk. Book yourselves some childcare (with advance notice to the concierge) and you can indulge at a local Spa, hit the fitness center, or go clubbing. Any of these hotels are also a very handy base to explore the many other Orlando family-friendly, non-theme park attractions during your Florida vacation. In addition to great room rates at participating hotels, guests get a “Disney Springs Deals” booklet which includes several use-anytime discounts. Other fun shops and activities to keep the kids busy include The LEGO Store, AMC Movies at Disney Springs 24, The Art of Disney, The LEGO Store, Build-A-Dino by Build-A-Bear Workshop, Disney Design-A-Tee, Disney’s Candy Cauldron, Disney’s Wonderful World of Memories, Splitsville Luxury Lanes bowling alley and many more. 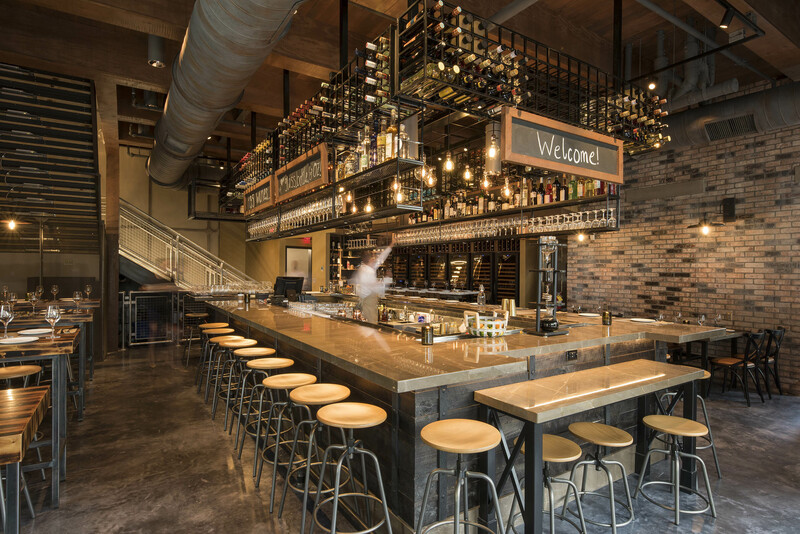 Among the many new dining offerings are Wine Bar George — where kids are welcome to sample tapas while over-21s can taste up to 150 different wines. There’s also celebrity Chef Rick Bayless’ Frontera Cocina, Paddlefish (situated on an iconic paddleboat), renowned Chef Art Smith’s Homecomin’, Morimoto Asia with a great Asian street food noodle bar, and STK Orlando. Disney Springs has special summer rates through September 3, 2018 and a Magic Fall offer valid for stays August 20-October 31, 2018. Staying at one of the seven properties guarantees an easy place to buy theme park tickets and souvenirs, shuttles to the parks and waterparks every 30 minutes, advance tee times and discounts at all Walt Disney World golf courses, and help with advance booking for all WDW dining and dinner show reservations for all restaurants. Note their rates often include free kids meals, but may not include the Resort Services Fee or daily parking fee (if applicable), taxes or gratuities. And if you book one of these hotels through the Walt Disney World Travel Service, there are extra perks in store. Plus, through year’s end, all Disney Springs hotels are offering an “Extra Magic Hours” coupon that means guests can take advantage of early or late park openings to visit when it’s less crowded. For additional information, visit Disney Springs hotels specials page. By the way, the seven Disney Springs Resort Area Hotels also offer a 20% room rate discount to American military, including U.S. Coast Guard and activated members of the National Guard or Reservists, plus separate discounts for AAA members. Some hotels allow kids 12 and under to dine free with an adult meal purchase, others waive Resort Fees, restrictions and black out dates may apply, so it’s best to check their site while planning. always has good deals during busy travel periods.